While tropical storm Erika lost its encounter with wind shear and the mountainous terrain of Hispaniola and Cuba ending up as a disorganized rain-maker, the ‘tropical wave assembly line’ in equatorial Africa continued producing tropical waves marching west toward the warn waters of the eastern Atlantic and ‘hurricane alley’. 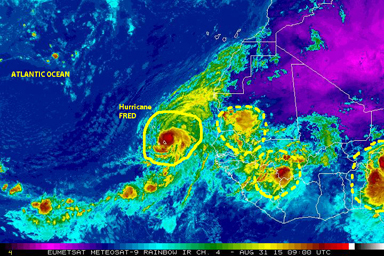 One of those recently emerged tropical waves has morfed into Hurricane FRED, the sixth named tropical cyclone of the 2015 Atlantic hurricane season. A Cape Verde hurricane none the less! 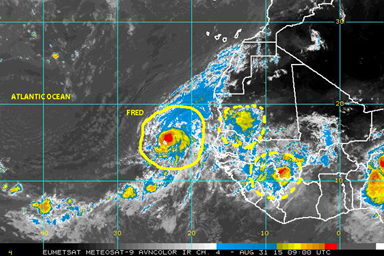 FRED will be one to monitors closely, no doubt, as it moves westward during the period that has historically marked the peak of the annual Atlantic season.